(1900-84) Hamilton Centre member; received Service Award in 1972. FRANK SCHNEIDER (1900-84) developed an interest in astronomy as a young boy in Yugoslavia. He emigrated in 1926, married and had two daughters, and took employment as an eyeglass specialist at the Steel Company of Canada, where he worked for 40 years. He applied his talent in optics to the making of telescopes. His first was an 20-cm reflector made soon after he joined the Hamilton Centre in 1932. The citation for his Service Award presented in 1972 stated, "He has served on both the local and national Councils of the Society and has been a frequent lecturer to meetings of the Hamilton Centre as well as to other local groups. 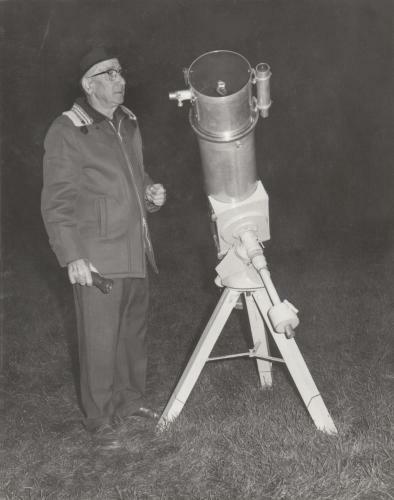 Frank Schneider successfully guided many Hamiltonians through the difficulties encountered in the construction of their telescopes and then set an example for them to follow as a tireless observer. Variable stars, meteors and solar eclipses were prominent among his observing interests." He also won wide acclaim for his photographic skill at the telescope and as a naturalist. Displaying 1 - 4 of 4 items (page 1 of 1).